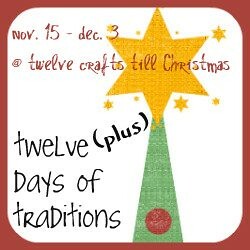 Twelve Crafts Till Christmas: the moment you've all been waiting for . . . Okay . . . you haven't been waiting for this moment at all because you didn't know IT was even coming. You may have guessed that this event was originally supposed to be 12 days . . . the 12 days before December 1. However, I got a bit carried away with scheduling, and I ended up with 15 days of traditions that some amazing bloggers will be sharing. I've spent the last ten months making gifts. I don't regret a minute of it. However, the reality is that in twenty years, my girls may not remember even one of those gifts. But they will remember our family traditions. They will remember that we put up our tree on December 6 - St. Nicholas' Day and had an indoor picnic by the tree. And they will remember that they got to open their St. Nicholas' boxes filled with candy and a few small gifts. They will remember the lighting of the Advent wreath every night at dinner. They will remember driving around looking at the Christmas' light in our town. They will remember the Christmas Eve candlelight service at church, opening jammies by the tree and eating finger food until bed time. Twelve (plus) days of traditions will give us a sneak peak into the traditions of some of our favorite bloggers in an effort to inspire us all to take time for traditions . . . to pause in the midst of all our crafting, gift-making and decorating and carve out some traditions for families. These amazing ladies have agreed to give us a little peak into their lives during the holidays. My regularly scheduled programming (if you can call it that) will be put on hold for these three weeks to help us focus on taking time for traditions. But there will be some surprises along the way. And I hope you will join us by posting your traditions on your own blog. 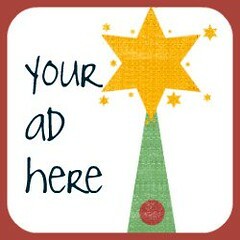 I will put up a linky on Monday and leave it up all three weeks for you to link up your own tradition posts . . . as many as you want to write. Join us! This is going to be so fun!! I can't wait to see what everyone does. :) We'll be adding some "new" traditions I'm sure! I love this idea! I will tell you, however, you kids will remember the gifts you made for them. I can still remember the clothes dolls I received from my mom. I still have one of those todays. I remember the homemade doll furniture my parents worked so hard to make. I remember those things because they were extra special. And the traditions were another gift--one's I am so excited to pass on to my own family. I love this idea. We have several traditions I am so happy with...and one that I've been working on to share with others. Can't wait to see everyone's contribution. Fun! I love your blog!!! 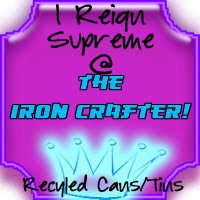 You have really inspired me to try new crafts, and I just REALLY REALLY like your blog!!! Thank you so much for sharing so many tutorials (which are so helpful). I'm hosting an Old-Fashion Christmas event later this month and I am planning to try some of your tutorials! I'm so looking forward to learning of other families' traditions and hopefully expanding ours. I wish that I'd found your blog earlier as it is so inspiring. 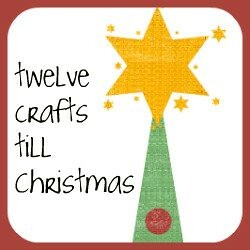 12 Crafts til Christmas is something that I'm going to be doing next year as I reckon the 12 projects will be a big boost to the present/decoration stash without increasing stress levels. I can't wait to see what everyone does!! This is my son's first Christmas and I can't wait to start some new traditions with him!!! This is going to be so awesome! Cannot wait to read about everyone's traditions!!! Thanks for putting this together!! I'm going to add the button right now! I'm so excited to read all the posts and to write my own! Let the fun begin!! What an amazing idea. I can't wait to read all the traditions. I LOVE this idea, how fun. I'll have to write a post on our family traditions. Thanks for coming up with such a fun idea. What a great way to remember the true meaning of the holidays. With a 2 and 4 year old this year it's important to start traditions this year. Thank you for hosting this. I can't wait!